Up ahead for the Cincinnati Bengals, the only Pennsylvania team that truly matters. 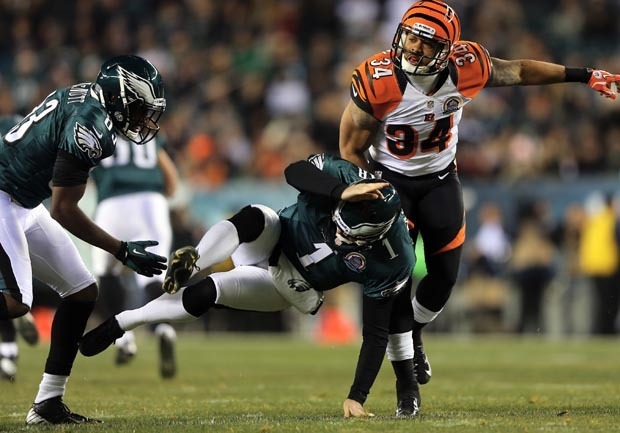 Andy Dalton threw a touchdown pass and ran for another score, an opportunistic defense forced five turnovers and Cincinnati beat the Philadelphia Eagles 34-13 on Thursday night. The Bengals (8-6) took a half-game lead over the Steelers for the last playoff spot in the AFC. But their game at Pittsburgh next week is far more important in the standings than this one. The Bengals would clinch their second straight playoff berth with a win over the Steelers if Pittsburgh loses at Dallas this Sunday. A loss to the Steelers, though, likely would ruin Cincinnati's chances because it would lose the tiebreaker. "We control what we can control," coach Marvin Lewis said. "We want to win in December, so we have a chance to win in January." Can they beat the Steelers? Probably not if they play like they did for most of their 60 minutes at Lincoln Financial Field. They committed 10 of their 11 penalties through the first three quarters. Dalton was sacked six times by one of the worst lines in the league. Dalton was an unimpressive 13 of 27 for 127 yards and a touchdown. No receiver had more than 63 yards. Funny how a playoff push can make those stats meaningless as long as the Bengals win. "We're playing for something now," Dalton said. "That's great and that's what makes it fun this time of year." But CBSSports.com's Clark Judge says if the Bengals continue playing this way, they are "toast." "It's not just that they were lackluster. They committed stupid penalties. They couldn't protect their quarterback. And their quarterback stunk. Yet they won ... only they really didn't," Judge writes. "The Philadelphia Eagles gave this one away, and if you don't believe me you must have missed Philadelphia's four turnovers in a brutal six-and-half minute span of the second half." The Eagles' season was lost a long time ago. They fell to 4-10, losing double-digit games for the first time since 2005, the year after losing the Super Bowl to New England. There were plenty of empty seats at the Linc, where fans are hoping this is Andy Reid's final season as coach. Reid led the Eagles to nine playoff appearances, six division titles and five NFC championship games in his first 13 years. But the Eagles will miss the playoffs for the second straight year and owner Jeffrey Lurie already said 8-8 would be "unacceptable." "I thought the effort was there and guys played hard," Reid said, "but you just can't have those turnovers. That's a problem." An interception by Leon Hall set up Dalton's go-ahead 11-yard TD run in the third quarter. Then Wallace Gilberry picked up Bryce Brown's fumble and ran it back 25 yards for another score and an 11-point lead. BenJarvus Green-Ellis ran for 106 yards, including a 1-yard TD run in the first quarter for Cincinnati. Dalton tossed a 5-yard scoring pass to A.J. Green in the fourth to cap a 24-point outburst in a span of 3:23. "Our goal is to win games. Period. We did that. Doesn't matter how we got there," cornerback Adam Jones said. "We can be better. We can be higher. And that's what we take from this game. Listen, we all know we need to play better as a defense next week. Because we have ourselves a big one next week." The Eagles committed three turnovers on three straight possessions at one point and then fumbled a kickoff when defensive lineman Cedric Thornton let the ball fall through his hands on a short kick. After beating Tampa Bay on a last-second TD last week to snap an eight-game losing streak, the Eagles tried to make it two in a row. Turnovers got in their way again. They've committed an NFL-high 34 and forced just 12 all season. The Eagles snapped a drought of 22 quarters without a turnover by recovering two fumbles in the second. Both led to field goals by Alex Henery, helping Philadelphia to a 13-10 halftime lead. Rookie Nick Foles made his fifth straight start for Michael Vick, who just returned to practice this week after sustaining a concussion on Nov. 11. Foles threw for 182 yards, one TD and one interception. Reid said Foles is still the starter. Down 13-10, the Bengals started their rally with a turnover. Hall intercepted Foles' deep pass and returned it 44 yards to the Eagles 40. Foles underthrew Jeremy Maclin, who was a few steps behind Hall. "I feel really good anytime I have one of our receivers vertical on a guy," Foles said. "I just have to get the ball out there and make a better throw." Green made an acrobatic catch for an 11-yard gain on third-and-9 a few plays before Dalton ran for the score to put the Bengals up 17-13. Foles, who threw for 381 yards to lead that comeback against the Bucs, hit Riley Cooper on an 11-yard TD pass to cut it to 10-7. Foles connected with Maclin on a 46-yard pass during the drive. The Eagles then forced their first turnover since Nov. 5 against New Orleans. Brandon Graham sacked Dalton, the ball popped loose and Trent Cole recovered at the Bengals 29. Just two plays in, Maclin fumbled after a 6-yard catch. Carlos Dunlap recovered and the Bengals started at the Eagles 44. Green-Ellis ran 29 yards on first down and scored a few plays later for a 7-0 lead. It got uglier for Philadelphia on the next possession. Mat McBriar punted into his own blocker, Daniel Herron picked it up and ran 3 yards to the Eagles 11. But Graham sacked Dalton and Cincinnati settled for Brown's 24-yard field goal that made it 10-0. The Bengals would get their act together and put a playoff berth in sight. "We're in control right now of where we end up," Dalton said. "And that's how you want it to be. We have two tough games ahead of us. But I know we will be ready to go." NOTES: Green-Ellis surpassed 1,000 yards rushing for second time in his career. He did it with New England in 2010. ... The Eagles had a season-high six sacks. They have eight in two games since defensive line coach Jim Washburn was fired, and had 20 in first 12 games. ... Bowles confirmed he interviewed for the coaching vacancy at Temple, his alma mater. ... Eagles RB LeSean McCoy and TE Brent Celek also sat out. Both players also are recovering from concussions. McCoy missed his fourth straight game, but returned to practice this week with Vick.